Asphalt remains the most common paving material in the United States, and most motorists don’t give it a second thought unless confronted with a pothole or paving project that slows down a commute. 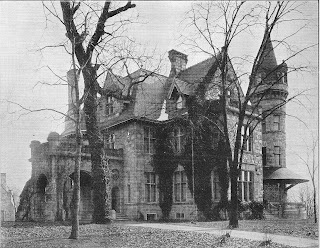 And few motorists descending the steep grade down 14th Street from Columbia Heights are likely aware that Washington resident Amzi L. Barber (1843-1909) was known as America’s “King of Asphalt” and lived in a lavish stone mansion at 14th Street and Clifton Street overlooking the city (left). He was also an early real estate developer that built thousands of homes, and one of the earliest automobile manufacturers in America. Amzi Lorenzo Barber (right) was born in Saxton’s River, Vermont on June 22, 1843, the son of Congregational Reverend Amzi Doolittle Barber and Nancy Irene Bailey. He graduated from Oberlin College in 1867, and had planned on attending the theological seminary there. Instead, Barber came to Washington in April of 1868 to work as director and professor at Howard University, by the invitation of General Otis O. Howard. That same year, he married Celia M. Bradley of Geneva, Ohio, who died just two years later. 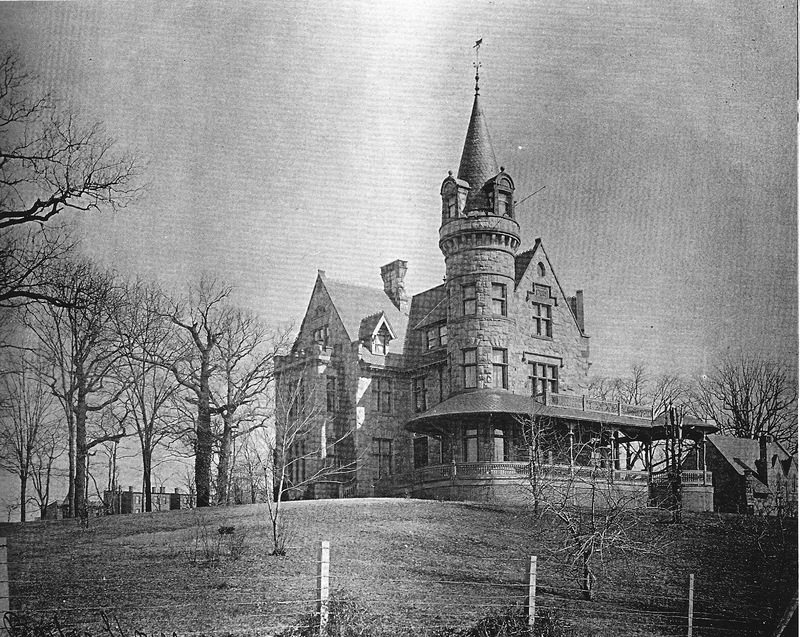 In 1871, Barber married Julia Louise Langdon, the daughter of successful real estate broker J. LeDroict Langdon and resigned his post at Howard the following year. They would eventually have five children together, four of whom survived to adulthood that included LeDroict, Lorena, Bertha, and Roland. 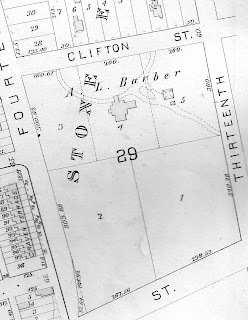 In 1872, Barber formed a new real estate development company with his new brother-in-law, Andrew Langdon, and others, having conveniently purchased 40 acres of land from the University for $50,000 upon which they would soon develop LeDroit Park. It was named after his father-in-law’s middle name, albeit without the awkward ‘c’ in LeDroict family name. LeDroit Park was developed as an exclusively white residential area, enforced by a wrought iron fence erected to surround the community, most of which was designed by architect James H. McGill. The fence became a focal point of unrest, and in July of 1888, it was torn down by protesting African Americans, which signaled a movement toward the integration of the area. 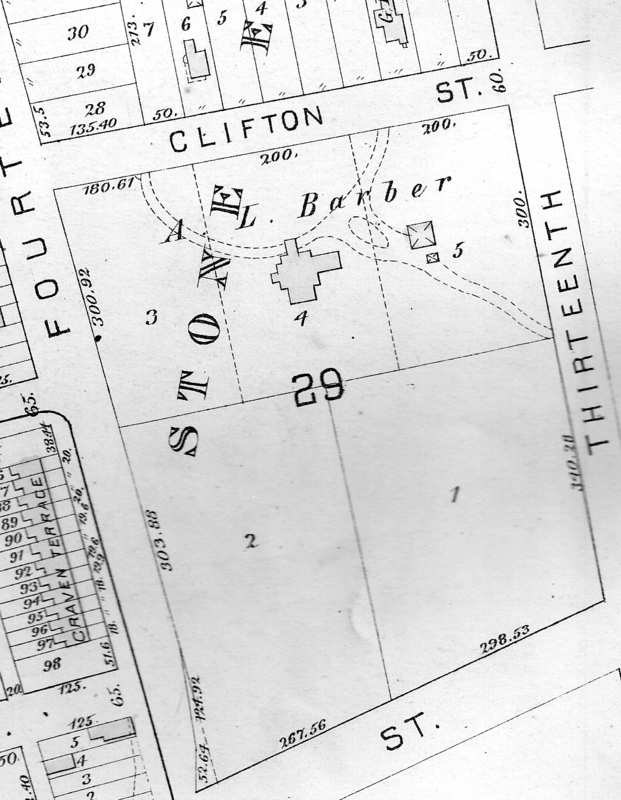 In 1893, a barber, Octavius Williams, became the first African American to move into the subdivision. was awarded contracts to pave streets by municipalities all over the nation and in Europe. In fact, it provided nearly 50% of all asphalt pavements laid in the United States by 1896. He attempted to squash all competition by establishing a trust in 1899 that sold $30 million dollars worth of shares, and Barber went into semi-retirement in London, England. An avid yachtsman, Barber launched the 300 foot steamer Lorena on January 14, 1903, named after his daughter, and purchased the $500,000 Robert Stewart mansion in Manhattan. 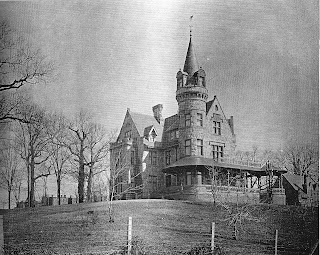 He eventually purchased the Cunard estate on Staten Island. Perhaps a natural business expansion to the asphalt industry was Barber’s entry into the automobile industry. One of the first automobiles produced was coined the “Locomobile,” created by brothers Francis and Freelan Stanley in 1898 (below). But only a few months into their venture, they sold their enterprise to Barber. 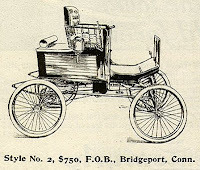 It was under his direction that the Locomobile name became a brand; The 1899 Locomobile sold for $600 and was advertised as both noiseless and odorless. 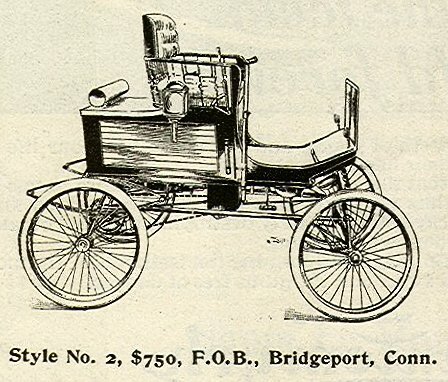 Sales of the Locomobile peaked in 1900 at sixteen hundred units, a remarkable figure nearly a decade before Ford streamlined the assembly line. Barber’s successful ventures as a businessman didn’t always go smoothly, however. In January of 1898, a court in New York awarded a former business partner a $700,000 payment from Barber’s paving company, and interest in any future profits. 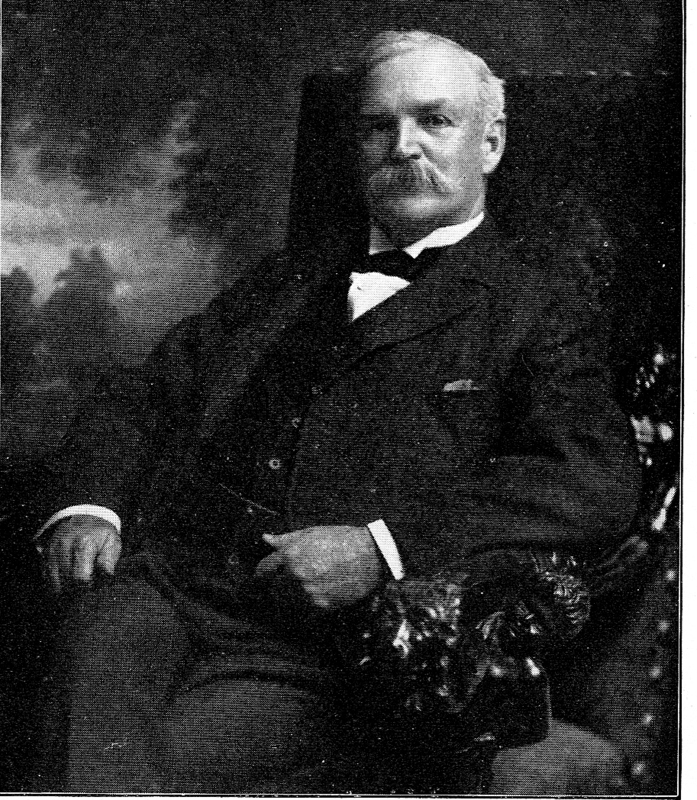 General W.W. Averill had formed the American Asphalt Company with Barber in 1881, having experimented and filed patents for many of the processes involved in the laying of pavement. Barber folded that company and formed his own a year later, and continued to use the same processes he learned from Averill. 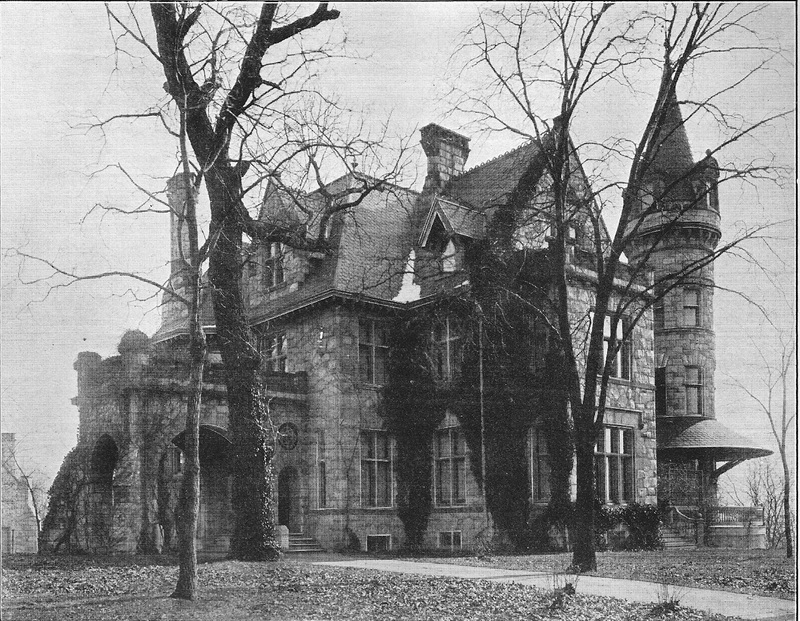 In 1912, a lawsuit was brought against the Barber estate from London resident William H. Colbran, who had built a house in that city for Barber in 1901, with an agreement that he would rent it for 21 years at an annual cost of $7,819. Barber lived there and paid rent for only the first three years. 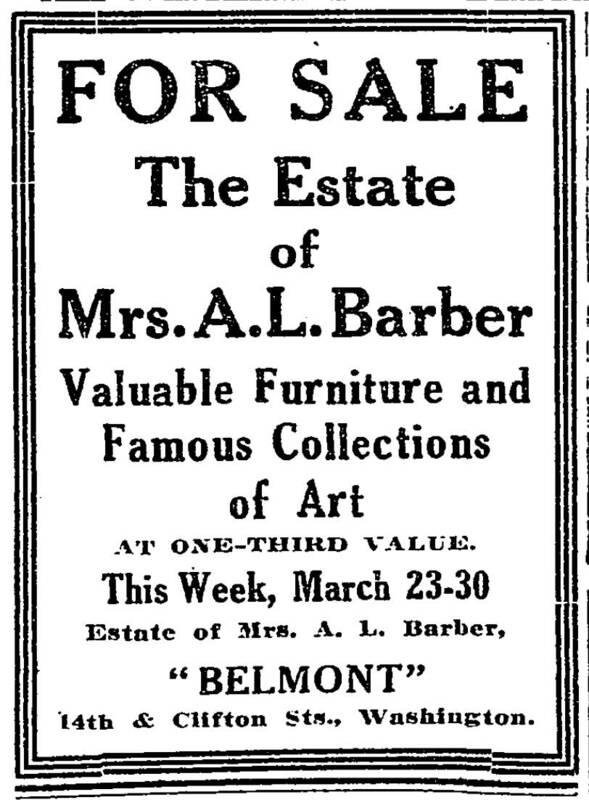 Following Barber’s death in 1909, his widow and son LeDroit continued to live at Belmont until its contents were sold in the spring of 1914. LeDroit Barber had the house razed a year later to make way for his own large scale real estate development, known as the Clifton Terrace apartment complex. Belmont Street was laid out on the southern portion of the property, the only reference of the once grand estate that remains to this day. Thanks for this post. My family had a house in the 1400 block of Clifton Street for approximately 50 years (until the late 1940s), so this was very interesting to read! It's pretty hard to imagine a world without asphalt. It is in everything now. Streets, sidewalks, and the skeleton of buildings all bear it inside. This is the only way it works, and it is very important. Interesting perspective on paving work. Thanks for sharing this most important blog with us. used by the Barber Asphalt Company was made from pitch or tar drawn from Pitch Lake in Trinidad where Amzi had obtained a 99 year lease from the British government. I believe it was the only known source of tar in the world at that time. In future years comercially viable tar was found in Venezuela and then in California. Amzi attempted to get a lease from the Venezuelan government similar to the Trinidad. Howeverver his effort was refused leading to competition is the road paving business. The Locomoble Company built well regarded cars, but it was a loss making venture. I believe that Amzi took out large bank loans with his personal guarantee to provide necessary cash and capital. As a result upon his death Amzi's estate was found to be under water much to the surprise of my great-grandmother and his daughters. In 1908 Locomobile won The Vanderbilt Cup race on Long Island. This was a a short lived time for celebration . Today there is a Locomobile Society made of over 600 proud members who own original Locomobiles may ben seen at the antique car museum in Reno and the Royal Scottish Museum in Edinburgh, Scotland. I believe that LeDroit L. Barber, Amzi's only son, pre-deceased him dying in 1905. His son-in-law, my grandfather Samuel T. Davis , suceeded Amzi as President of Locomobile. Sadly Sam Davis died at the age of 40 in 1914, a great tragedy for the surviving family.